It has been 20 years since the Berlin Wall came down. With the euphoria of reunification came massive redevelopment along the wall and the eastern part of the city. My West German friends from southern Germany weren't pleased with the money spent on reconstructing the city. However, as a tourist, I begged to disagree. At least, the money went into something more productive, resurrecting a grand European city and attracting hordes of tourists than on silly stuff, like a war. In the 1990's, Berlin was the world's largest construction site. 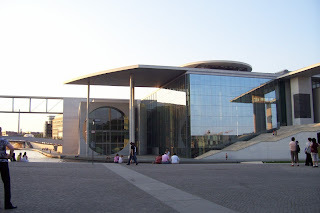 The government centre next to the Reichstag is the most prominent of the new sites. 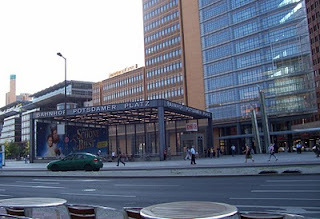 On Potsdamer Platz, a whole city quarter was built from scratch. East Berlin streets were gentrified, historical sites, museums, palaces were spruced up. However, on the east side I discovered there were still pockets of the old, dull, regimented East Berlin. 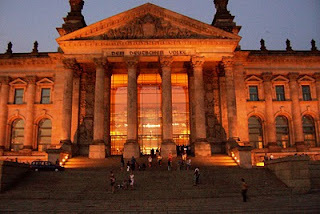 My visit in June 2007 started at the humongous steel and glass Berlin Banhof. The train terminal is a delightful attraction on its own, like a giant mall on 5 levels, expanded with additional lines and tunnels right after reunification. From the bus bay across the station, I took a bus to take me to an apartment hotel somewhere in the Mitte (central district) according to Berlin Tourism. The building was indeed in the Mitte, but step onto the street, it was in another quarter. I got off the wrong stop, and took an hour walking up and down Chausseestrasse looking for the place. A few decaying, utilitarian housing blocks, '50s vintage subway station and trains were tell tale signs I was on the East side. There was no restaurant within several square blocks. The closest, convenience store was 150 metres from the apartment, tucked away on a side street, opened for a few hours only (almost by appointment I thought). A proper grocery was 2 metro stops away. The lady manager was stern and totally unfriendly. She had a knack for pointing a curled finger at guests to get their attention. Attitudes seemed slow to change on the East side. 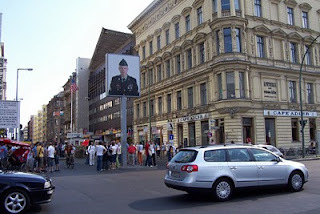 The main attraction of the Berlin Wall era is, of course, Checkpoint Charlie at the end of Friederichstrasse. The former border crossing is now a slightly tacky shrine crawling with tourists and souvenir hawkers. Cafe Adler, a museum, a mural on one corner, little memorials on a street corner, bits and pieces of the grafitti laden wall tell a poignant story of a divided past. 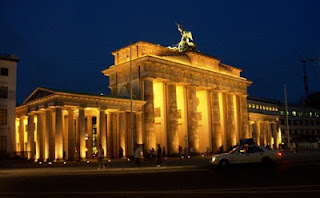 Going back on Friedrichstrasse along gentrified shops and buildings, I came to Unter den Linden and Brandenberg Tor, the remaining city gate from the 18th century. 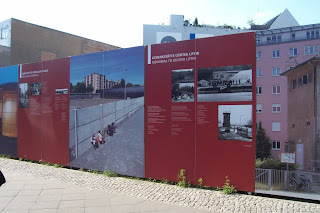 The gate symbolized the division of Berlin during the cold war with the wall cutting right in front of the gate. A short walk from Brandenberg Tor is the Reichstag, often featured in war movies with Russian soldiers storming the building in the last days of Nazi Germany. On top of the new home of the German parliament sits a striking, egg shaped glass dome. Inside, a spiral walkway winds its way to the top like a cloud. The dome is in quite contrast with the massive granite structure it sits on which makes it more interesting. 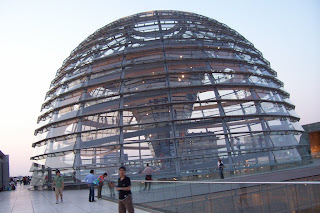 Beside the Reichstag is the massive futuristic government complex stretching along the river Spree. The glass and steel complex symbolically sits on either (west and east) side of the river. It is the least non-government looking and most people friendly government centres I've ever seen. Promenades, cafes, numerous pedestrian bridges, parks, outdoor galleries on sections of the old wall, are mixed in with the office structures. One wonders how government business gets done in such a kick back environment. My West German friends had every right to feel miffed about the cost of the reconstruction. Berlin's extreme makeover looks like the government didn't spare a penny.